Shiraz is one of the most amazing and historical cities in Iran which is also well-known for its famous poets, Persian Gardens, traditional houses and of course the Persepolis. The city is almost included in all tourists’ itineraries, and people who travel to Iran for the first time, never go back to their homes, without visiting Shiraz, the city of art and poems. It is actually one of the most famous destinations for local people too, and lots of tours of Shiraz are conducted all over the year. Here, we are going to introduce the city in more details. Shiraz covers an area of 122,400 km², and it is located in the southwest of Iran at the foot of Zagros Mountain with the altitude of 1,500 meters (4,900 feet) above sea level. It is surrounded by Derak mount in west, Bamoo and Baba koohi mounts in the north. It is about 684 kilometers (425 miles) far from Tehran, the capital city, which will be accessible through plane, train, and bus. Due to the geographical position and altitude of the city, there are 4 distinct seasons during the year. It has a marvelous spring and short hot-summer with the average high temperature in July around 39 °C (100 °F). Winters are very cold and the average low temperatures during December and January is around -15 °C (7 °F). The city itself has the inhabitant of approximately 1,700,000 people, and therefore, the city is counted as one of the most populated cities in Iran. There is also a newly built town called "Shahr-e Jadid-e Sadra" (Sadra New Town) close to the city which has a population of 1,500,000. As a result, the city including suburbia areas has more than 3 million population. History of Shiraz, the same as the country itself, divided into three eras; pre-Islamic era, Islamic era, and lastly modern era. According to the evidence, it is believed that Shiraz has the history of more than 4,000 years, its name was mentioned in cuneiform inscriptions in 2000 BC. During the pre-Islamic era, at the time of Achaemenid Dynasty, Shiraz was located at the center of a number of very important cities, such as Susa, Persepolis, and Pasargadae. After Arab Invaders, in 693, Shiraz became even more important under the Arabs governor, in addition to several local dynasties. During the Sassanid era, Shiraz acted as the main connection between the way which was connecting Bishapur and Gur to Istakhr. Between the years 945 to 1055, Shiraz was the capital city of Buyid dynasty, and later in Zand dynasty, Karim Khan Zand reconstructed the city and built a royal district with a fortress, many administrative buildings, a mosque and one of the beautifully covered bazaars in Iran. Fortunately, all of these constructions still remained and is one of the great places to visit when traveling to Shiraz. During the Zand dynasty when Shiraz was the capital city of Iran, it was a small village limited to Arg of Karim Khan and naturally, there were several villages near it. The north part of old Shiraz (now Qasr al-dasht and Chamran) was completely covered with gardens and green trees that still remain. In Pahlavi dynasty, it became the center of attention due to the 2,500-year celebration of the Persian Empire. Tombs of famous poets such as Hafiz and Sa'di were also constructed during that period. In the modern era, after the Islamic Revolution, Shiraz has been considered as the capital of Iranian culture, art, literature, and poem. Being a historical city, there are a number of attractions in and around the city that are worth visiting when you travel to Shiraz. 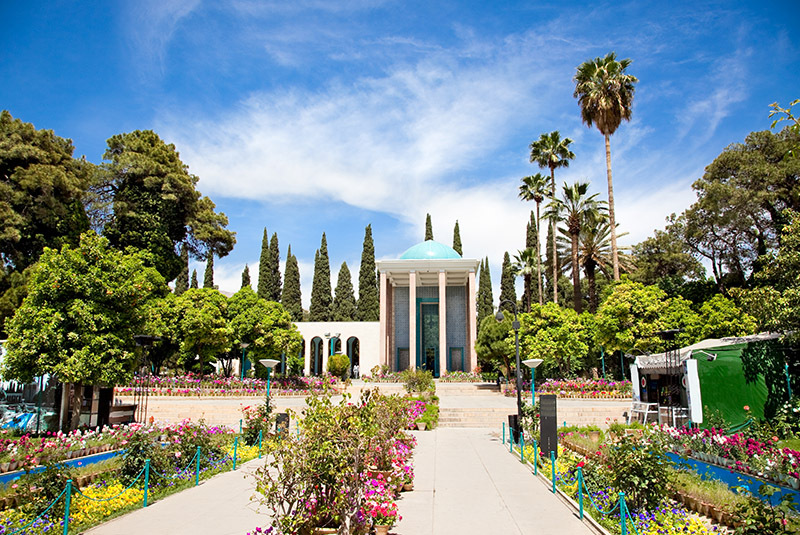 Two of the most famous poets of Iran, Hafez and Saadi, are from Shiraz, and their tombs are located in the northern part of the city, each one in a wonderful garden. 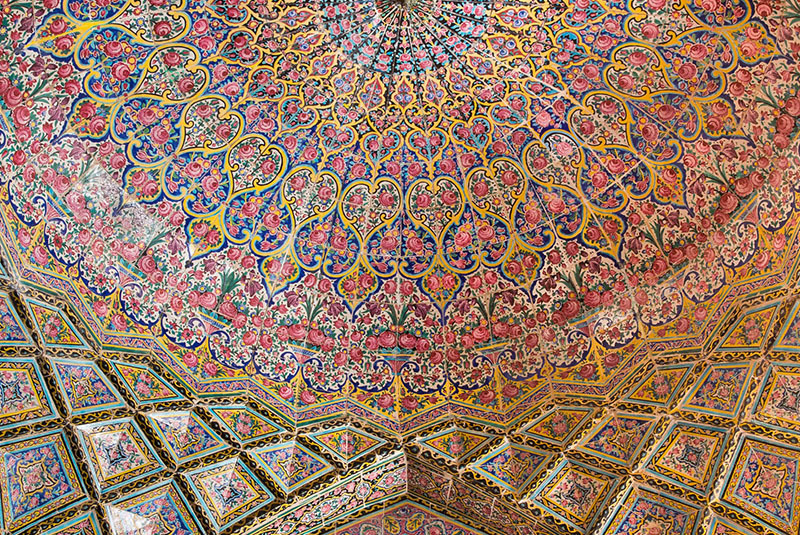 The complex of Tomb of Hafez in known as “Hafezieh”, and Tomb of Sa’dy is known as “Sa’dieh”. The same as other cities in Iran, there is a complex including a mosque, bazaar, bath, and school at the heart of the city. In Shiraz, you will see Vakil complex including a mosque, bazaar, and a bath right at the center of the city. There are a number of magnificent gardens in the city, and actually, Shiraz is known for having these wonderful gardens among all people. 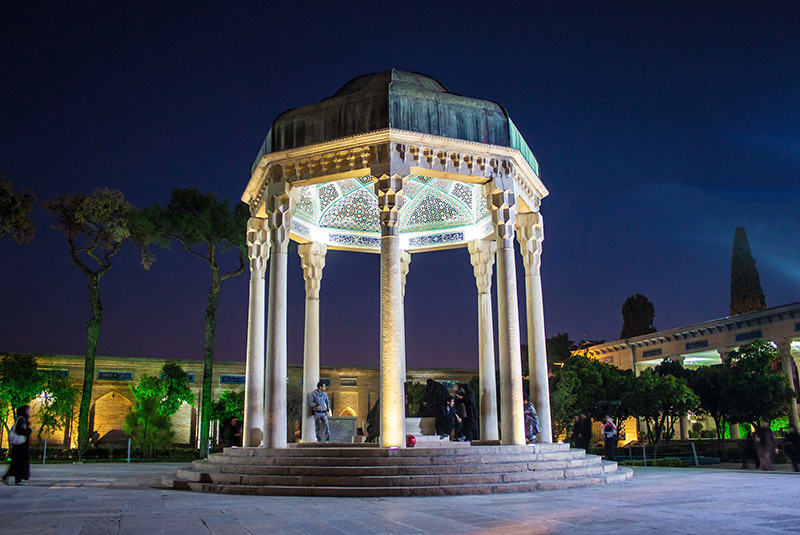 Eram Garden, one of the nine Persian Gardens, is at the city, with more than 200 years of history. In addition, there are also Golshan Garden, Jahan Nama Garden, Delgosha Garden, and Pars Museum (Nazar Garden). Magnificent historical houses are the must-see places in the city, for instance, Narenjestan Qavam, Zinat-ol Molk, and Ziaeean. Nasir-ol-Molk Mosque, Atiq Jame Mosque, and Shah e Cheraq Holy Shrine are the religious places in the city. Please remember, it is an obligation to wear “chador” when you want to enter Shah-e Cheragh Holy Shrine to show your respect to the place. You can borrow one at the entrance. Attractions of Shiraz is not limited to the ones inside the city. In about 140 Km to the northeast of Shiraz, the great Pasargadae Landscape is located. Visiting this place is never completed without having a visit to the Persepolis, Naqsh-e-Rostam, and Naqsh-e-Rajab. Moreover, if you are interested in nature, there is also a beautiful waterfall named Margoon in about 150 Kilometers to the city central. To have more information about these places you can check the best places to visit in Shiraz here. 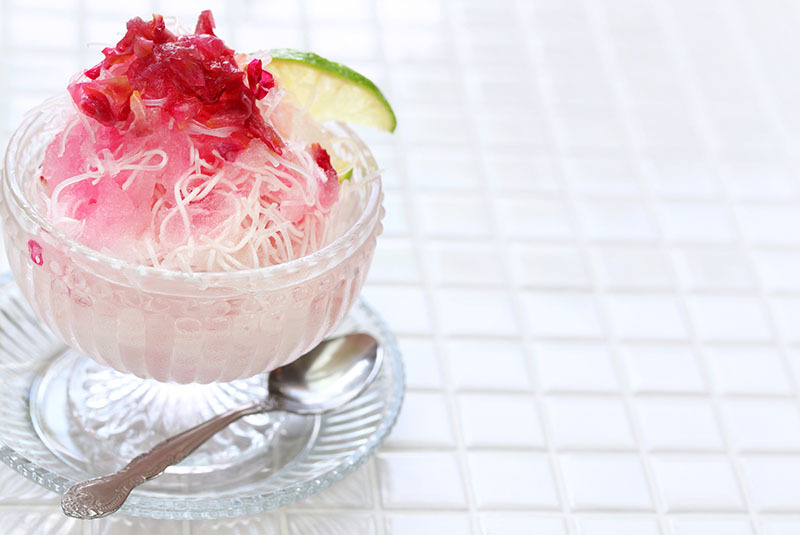 In addition, Shiraz is also known for its delicious desserts, Koloocheh Masghati, and Faloudeh or Paloudeh Shirazi (A dessert with semi-frozen noodles, rosewater syrup, and lime juice).